Let me introduce you to Pota-Toss, a gorgeous potato tossing artillery game currently seeking Kickstarter funding for development. It’s like Scorched Earth, or Angry Birds but where you aim at the bases of human opponents instead of computer pigs. What makes Pota-Toss special is that the beautifully drawn levels correspond to the GPS-location and local time of the players. If it’s 6pm and I’m playing from New York, I’ll play in front of the NYC skyline at sunset. 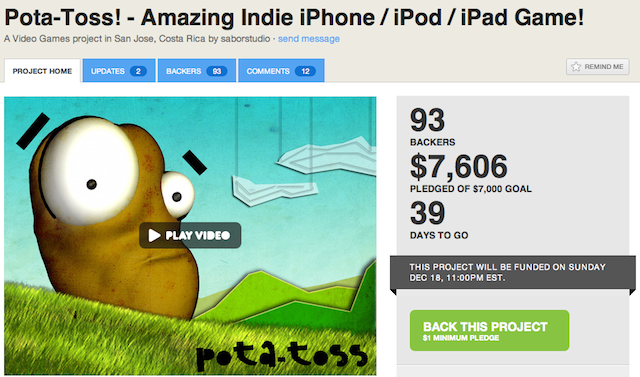 Pota-Toss just showed up on Kickstarter on Friday, where the Costa Rican developer Saborstudio is looking for a lean $7,000 to finish production of an iOS version. With gorgeous level art, goofy characters, a proven physics-based game concept, and a sprinkling of innovation, I think Pota-Toss could be a hit. The developers seem to think so too because they’re not looking for venture capital yet. I’d imagine they want to get into the App Store and gain some traction before giving away too much equity at too low a valuation. Instead, big backers of their Kickstarter will get a piece of potato ammo with their name and face, or their own logo on one of the game’s backdrops. The funding will go towards legal fees, licenses, development and testing equipment, and manpower. Saborstudio aims to launch Pota-toss with over 200 levels featuring obstacles corresponding to different locations around the world, and they plan to release more levels for better coverage of the world’s varying terrain in monthly updates. If two distant players are competing, their level will be split down the middle between the different local times and terrains. The graphical style is rich and textured, with a combination of water colors and paper cut-outs that I can see myself happy to gaze at while waiting for a friend to shoot. There are certainly some issues despite the basic premise seeming awesome. Even with the option to compete against someone next to you, requiring a human opponent can cause delays and limit how people play. A solid single player mode would be advised. Also, the developers will have to find a way to equalize the difficulty of different terrains so someone who lives near the Grand Canyon isn’t unbeatable because they’re protected by a cliff. The potatoes themselves already look kinda cute and goofy, though they still might not be quite as franchise-worthy as the cast of Angry Birds. Monetization strategies could include in-app purchases of more powerful potato ammo similar to the Golden Eagle, special defenses for your base, and levels containing popular landmarks. Paid versions could be released for different seasons. I’m imagining the Statue of Liberty covered in snow or triggering a landslide of Easter eggs into my opponent’s base. Judging from their plucky, endearing Kickstarter video, the developers already have a good sense of marketing. I’m confident they would have reached their funding goal without this article. But I love the intersection between art and technology, and I love games, and I want to play Pota-Toss soon.